He also sent along a link to the image of the quote shown above (I’ve of course added the “Fake” stamp of disapproval). My first thought was that this was likely fake, then I briefly considered it to be a reasonable paraphrase of a passage I’m familiar with, then after a comment from a reader (see below) I decided to categorize it as fake because I realized that the paraphrase does actually change the sense of the original in a significant way. Note the two minor differences from the Facebook version: would/could, and hurt/harm. The Salzberg version was repeated in Don Morreale’s 1998 The Complete Guide to Buddhist America, and in a couple of later books as well. This turned into “If you truly loved yourself, you would never hurt another” in 2009’s Contentment and the Wizard, by W. T. Watts, Ph.D. This brings us just one word away from the original Salzberg/Goldstein version. The Buddha said that if we truly loved ourselves we would never harm another, because if we harm another it in some way diminishes who we are. The Buddha said at one point that if we truly loved ourselves we would never harm another, because if we harm another it is in some way diminishing who we are; it is taking away from rather than adding to our lives. The Buddha never said anything like this extended version. The language of “diminishing who we are” is too contemporary and sophisticated for the Pali canon, for example. And I’m not clear that there’s anything in the early teachings that distinguishes “truly loving ourselves” from any other kind of loving ourselves, unless it’s the distinction between pema (conditional affection) and metta (universal lovingkindness), which are contrasted in Buddhist teachings. But on the whole, taking the quotation in this expanded context, it seemed even less likely that this was a genuine quote from the Buddhist scriptures. Now “you shouldn’t hurt others if you love yourself” is rather different in meaning from “If you truly loved yourself you would never harm another.” The shift from “should” to “would” changes the sense of what’s being said, from an practice that’s to be undertaken (“you love yourself, so bearing in mind that others too love themselves, you shouldn’t harm them”) to something that simply happens (“you love yourself, therefore you will not harm others”). The Buddha takes loving oneself as a given, and suggests that we need to work on extending that love to others. Sharon Salzberg is suggesting that we don’t really love ourselves, and that if we did learn to really love ourselves, we’d love others too. 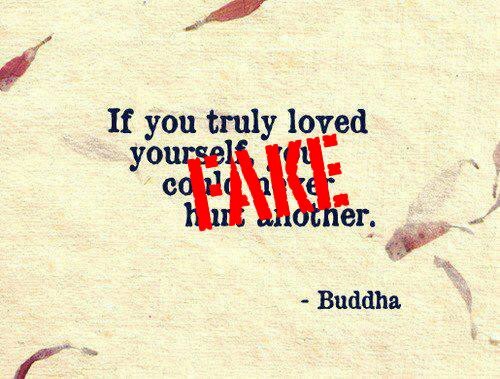 The Buddha’s suggestion is not that we love ourselves more, while that’s precisely what Sharon is suggesting. These are radically different messages, and Sharon’s paraphrase isn’t acceptable as reading of the original text. This quote fits with a certain pattern of thought that’s been expressed many times. A close parallel is from an article in the Saturday Review from 1972: “[I]f we truly love ourselves, we will love others.” It’s hard to tell from Google Books’ snippet view, but the author of that quote is Anthea Lahr, who is reviewing Albert B. Cleage’s Black Christian Nationalism. And even earlier we have the message “It is our good to bring good to those we love; and so far as we truly love ourselves we love all men we know, for we are of one flesh and one kind,” which is found in Samuel Martin Thompson’s 1955 A Modern Philosophy of Religion. Neither of these seems to be inspired by Buddhism, and in fact both are presented in an explicitly Christian context. I suspect that it was an awareness of sayings like those that led Sharon Salzberg to the formulation that she tends to use: “If we truly loved ourselves we would never harm another.” This formulation is attractive because it’s what, perhaps, we want the Buddha to say. It’s the absence of this sentiment in Buddhism, combined with its frequency in western culture, which makes it desirable. We’re filling a gap. However we’re filling it with something that the Buddha, so far as we know, didn’t actually teach. With the exception of Insight Meditation, Sharon always presents the saying in the style of a paraphrase rather than presenting it as a direct quotation. The fact that the only place in her books where the saying is presented as a quote (that I know of) is in a sidebar rather than in the body of the text makes me wonder if the “quote” has been created from Sharon’s words by an editor rather than by the author herself. So the evidence that Sharon Salzberg created the quote is questionable, but it does seem to represent what she thinks the Buddha taught. I respectfully disagree. I believe the quoted sentence “if we truly loved ourselves we would never harm another” is perfectly fine, and here “would” might even be a better translation than “should”. The spoken verse is one of my bante’s favotite and he talked about it for several times. From my understanding of my bante’s teaching, this verse is about when one has true loving kindness upon oneself, s/he doesn’t hold any grudges towards anybody (grudges against others is a hurt on oneself). Therefore s/he naturally wouldn’t want to hurt others. I think we need to be very careful when discussing Buddha’s words based on English translation. So what this is saying is that we are all more dear to ourselves than anyone else is, and we should recognize that others are dear to themselves in the same way also, and so we shouldn’t harm them. It doesn’t suggest that we should be dear to ourselves. It assumes we already are. This isn’t talking about some ideal state of self-metta. It’s talking about the ordinary care that we have for ourselves, where we don’t want to be hurt, and want to experience pleasure or happiness. If we recognize this in ourselves, and then see that others have exactly the same basic attitude of being dear to themselves, then we have empathy (anukampā). And once we have empathy, then we can have mettā. If you have other suggestions about the translation, then I’d be happy to hear them. As I said, my Pali skills are rather rusty, and to be honest my translation skills were never that great, having only studied Pali at university for two years.